And here they come again! Corina de La Rosa and her dance partner Alejandro Andrian will teach in Basel one of their popular seminars. Everyone, who knows them, can tell you about the great pleasure of working with them. The seminar focuses on the topic of improvising in the embrace and „tango à la carte“. This means that you can tell us one month in advance your desired topic and they will include it in their preparation. Therefore, the seminar has the title: "Tango, La co-creacion abrazada y a la cartê"
"Tango – the co-creation of an embrace + à la carte "
What is the essence of tango and how one dances tango? 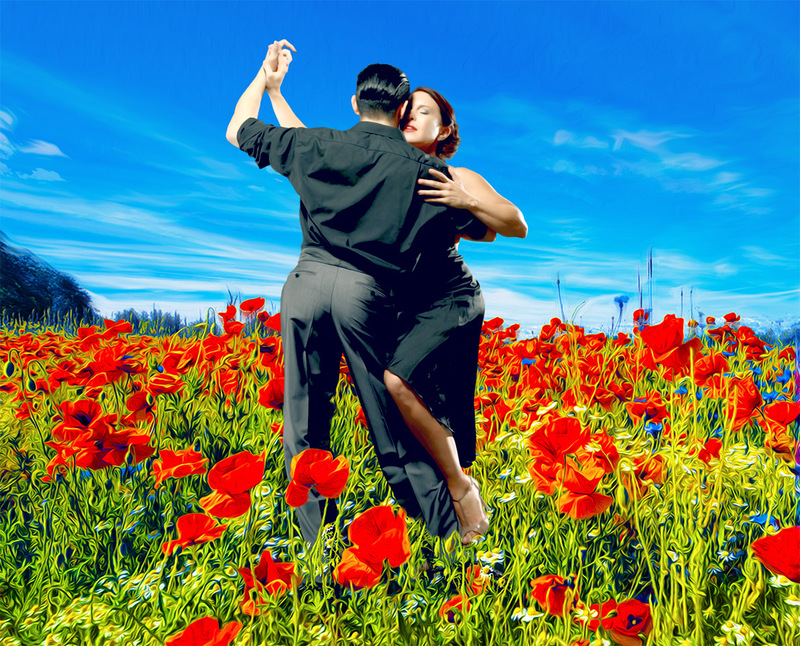 How does the tango differ from other dances? At first glance, it seems to be the music. However, there are people who also dance tango steps to other music styles. Tango has some unique elements which distinguishes it from other dances, for example: „el cruce“, the „mulinete“ of the woman, the endless possibilities to create something new and amongst many other things, the opportunity to change often the dance partner. Furthermore, we never repeat the same routine (or only if our memory deceives us), repetition creates always a new routine. The embrace, which can be close or open, needs a constant connection to the partner. It is, as a matter of fact, an embrace, which intertwines two bodies into one without the loss of autonomy and by using a certain body language. We can call the feeling of creating together this embrace „freedom“. Yet, this feeling needs a profound knowledge of the body and movement. In addition, it needs the ability to adapt to the changement of the dance partner. In this seminar, we are going to explore the basic elements of tango: the „caminata”, the „cruce”, the technique of „giros“, the connection of the dance couple, and the musicality to improvise these elements while dancing. This time, we give you the opportunity to choose themes à la carte. One month before the seminar, the participants can propose elements and figures which they want to learn or write about their difficulties and insecurities. We will consider these wishes in our preparation. In the seminar, we are going to deepen the improvisation of tango. Every day, one hour will be dedicated to body work in order to prepare the body for its task. The seminar has 16 hours of tuition. Corina De La Rosa is one of the recognised greats in the Tango world. Her tango style is unique and her technique is sophisticated and articulated. She is a tango dancer and choreographer. She earned a degree as a Classical Ballet teacher and began to teach. She continued her training with Estela Erman and explored the modern dance scene with Cristina Barnils, who has guided her through her movement training and teaching method. He began his artistic training at the age of 10 in his hometown María Grande Entre Rios. During the next 10 years, he trained as a tango dancer completing his apprenticeship with Classical Dances, Contemporary Air Shows and Theater. Since 2009, he has been working professionally in the most prestigious tango shows in Argentina. He toured more than 40 countries dancing and being part of the best tango companies in the world. For the last 3 years they have danced and worked together in Buenos Aires. Each benefits from the partner's experience. This creates a powerful and deep-seated fusion, whether it is in dance performances or in class. The seminar fees have to be payed immediately after receipt of confirmation. Conditions: Cancellation charge: 30 days prior, 50% of the price, thereafter 100% of the price. At the point where the River Rhine turns north, where the borders of France, Switzerland and Germany meet, you’ll find a city full of surprises. Basel is a city of art and culture and boasts one of Europe’s most beautiful and best preserved old towns.